The phlox divaricata May Breeze is a spreading perennial originating from eastern North America going all the way to Texas and Florida. There are many variations in the wild population in appearance, cultural needs and hardiness. the northerly types are completely herbaceous while the southerly population grows fully evergreen mats of foliage. This phlox spreads through its roots, growing outward in clumps of oval, hairy semi-evergreen leaves. Mats of fresh foliage appear every spring rising form stems tipped with delicate, fragrant, star shaped flowers. The blooming time is dependent on the growing zone, but the May Breeze blooms from early to late spring. The showy phlox is disease resistant and an excellent choice for regions with hot, humid summers. You can propagate through division in early fall. It is tolerant to full sun conditions in cool summer regions. Optimum sun conditions partial sun to full shade in neutral soils that have normal drainage. It will grow well in clay and loam soils and requires average watering. Although self-sowing this phlox is not a repeat bloomer. Its foliage is light green with white or light blue flowers. It requires minimal maintenance and has an average growth rate. The May Breeze grows to heights of 12-16” with a 12-23” spread. This creeping woodland phlox is a good pick for a woodland garden and an excellent plant for naturalizing. 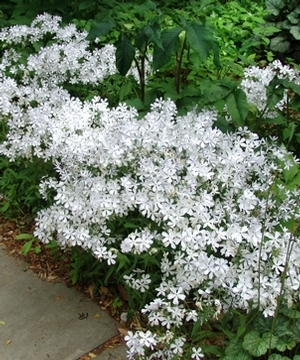 It may appear pallid as the season progresses so it is prudent to plant it among other wildflowers with vibrant blooms. When grown in the wild it favors prairies, moist, open forests and meadows. It is an excellent border plant with good texture and great form. It can also adapt to alpine and rock terrain but is versatile enough to be grown in a container or as an edging. The fragrant flowers can be cut for a vase or bouquet. If you’re wondering where to buy woodland phlox, GreenwoodNursery.com has them today! Thank you to North Creek Nurseries for the beautiful picture.